Business also has an important role to play vis-a-vis consumer protection. 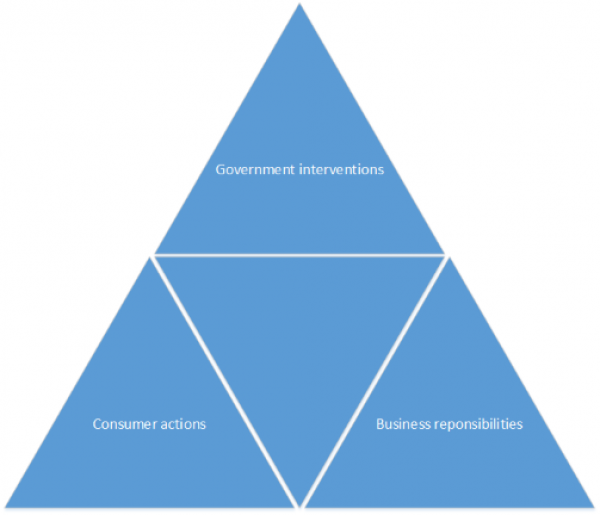 Business is one of the components that completes the triangle for a comprehensive consumer protection system. Customers are the lifeline of most businesses. In order to ensure long-term sustainable growth and success for their business, business proprietors and managers need to be able to understand consumer demands and anticipate future trends; pay close attention to consumer opinion polls, feedback, and attitudes; and respond to consumer complaints in a timely and effective manner; in addition to constantly improving product designs, production and delivery. This is based on the recognition that the relationship between consumers and business does not just happen during a transaction; but starts from the initial stages of market research, marketing and advertising; and extends beyond the actual supply of goods and services to customer care, warranty and repair, etc. As products or services can be defective or there is need for more product and service information, businesses are increasingly setting up customer hotlines, inquiry desks and consumer complaint-handling sections/departments to respond to the needs of consumers. Consumer Complaints and Disputes - Businesses should make available complaints-handling mechanisms that provide consumers with expeditious, fair, transparent, inexpensive, accessible, speedy and effective dispute resolution without unnecessary cost or burden.